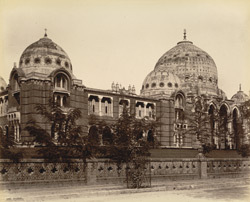 Photograph of Baroda College, at Baroda, Gujarat from the Curzon Collection, taken by an unknown photographer during the 1890s. The college was founded in 1882 and built in the late 19th century. It was designed by Robert Fellowes Chisholm (1840-1915) in an Indo-Saracenic style. This view from the south-west shows the façade, a fusion of Indian and Byzantine arches and domes in brick and polychromed stone. To the right is the massive dome on the examination hall, modelled after the great dome of the tomb of Sultan Mohammed (ruled 1626-1656) at Bijapur known as the Gol Gumbaz.